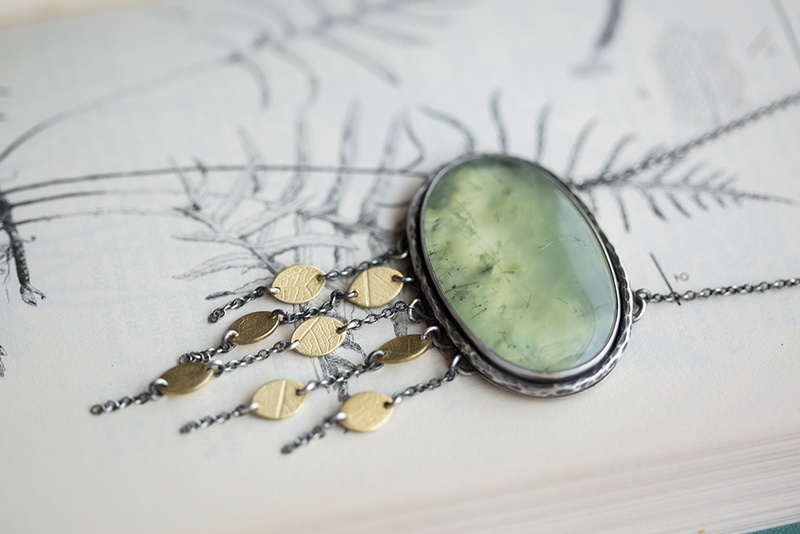 Tolkien’s words can be found in nearly every groove and beneath every stone in this year’s “Mossflower Collection.” As I read The Silmarillion and worked on this collection, I was able to watch as my designs leaned into that otherworldly aesthetic. In reading The Silmarillion, I became especially enchanted with Yavanna, one of the lesser gods of Arda, who walked the land in ever-changing form. Sometimes she looked like a woman dressed in flowing robes of spring green. Other times she took the shape of a tree wherein one could discern that her hair was actually fine willow fronds and her hands were slender branches. In the beginning of the First Age, Yavanna was the power that conjured greenery to cover the land. 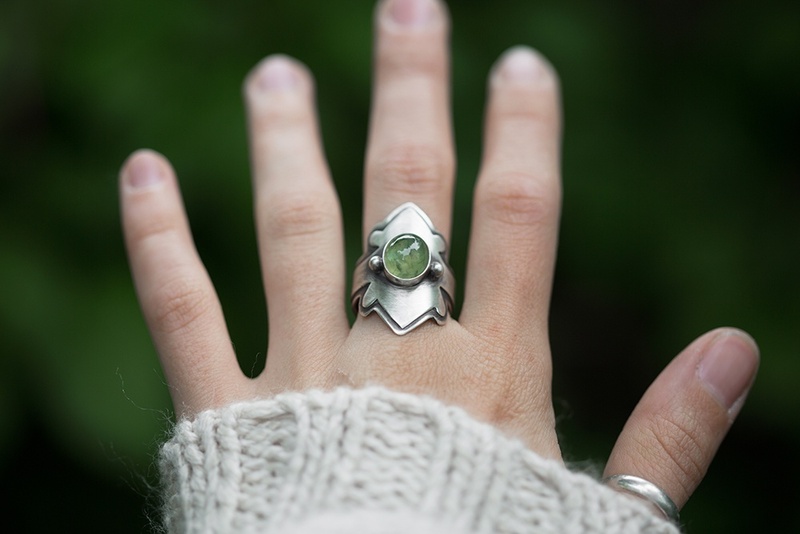 And this is the ring I designed specifically for Yavanna’s hand. All spring I have watched her move about Arda alone, forming trees and flowers, the first in the world. Hands with the strength to bend trees and twist branches, and fingers with the gentleness to coax young sprouts up from the earth. 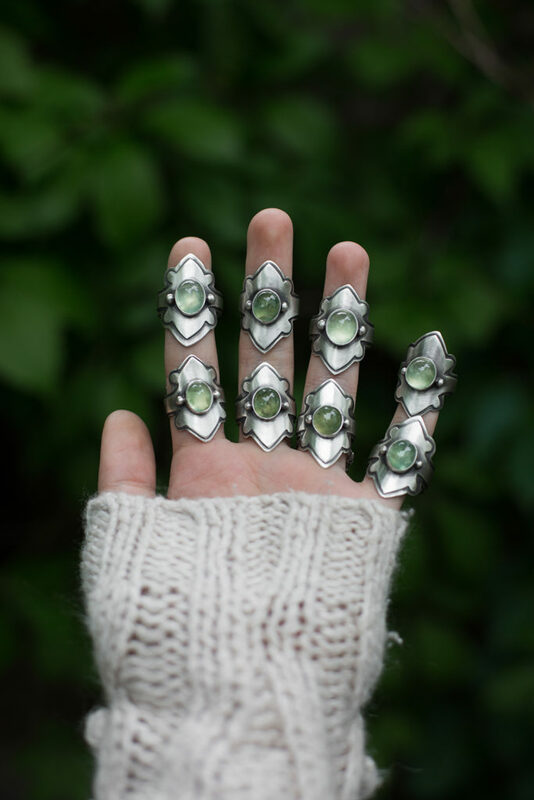 A ring for that hand would need to be sturdy, and so two layers of sterling silver to wrap around the finger. The band resembles a star to reflect the Valar, regal and ancient. 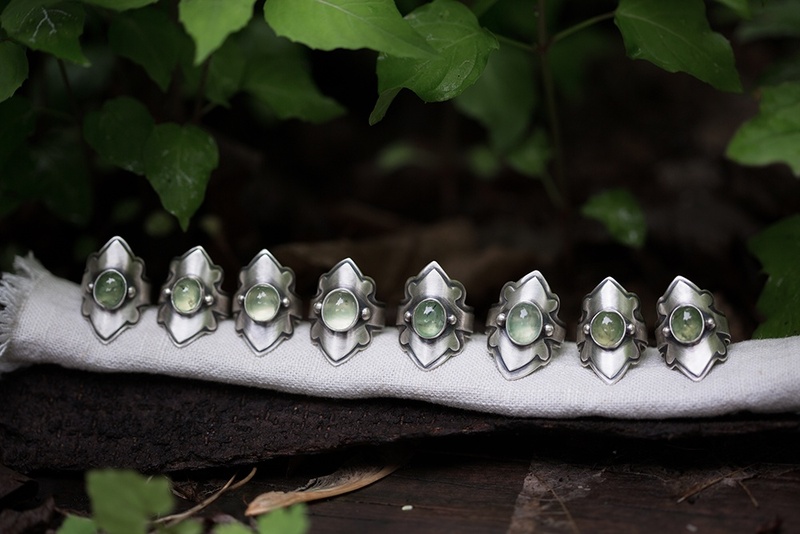 And atop the band is a single prehnite gemstone set between two sterling silver pebbles, like those earliest of plants shaped by Yavanna, which must have seem such tiny, fragile things admidst all those rivers and rocks. But that bit of green flourished and swept over the landscape until all was rich and verdant. 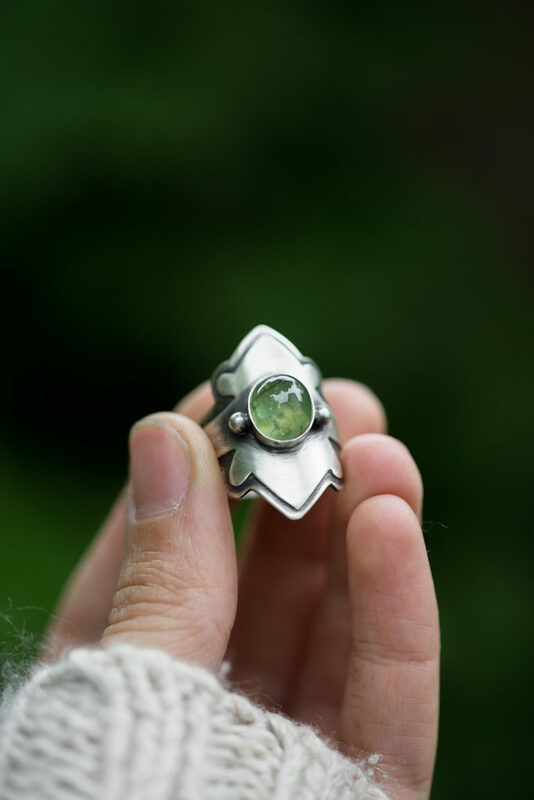 A ring for the Vala of the woods. And then the earrings and necklaces. 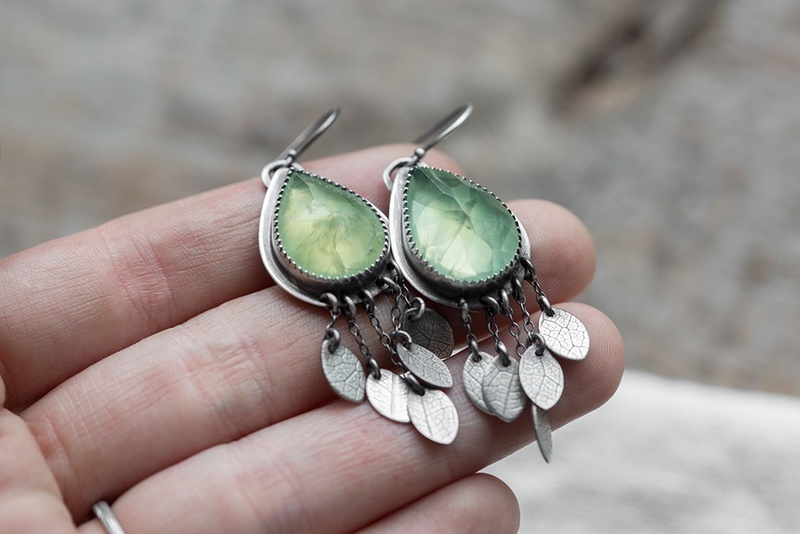 These pieces were designed with the Two Trees of Valinor on my mind. After the earth was covered with green, Yavanna withdrew to the undying lands and set to work on her finest creations, the Two Trees named Telperion and Laurelin, which brought the light to the land of Valinor. These two trees waxed and waned throughout the day and night giving forth their own light, each distinct. 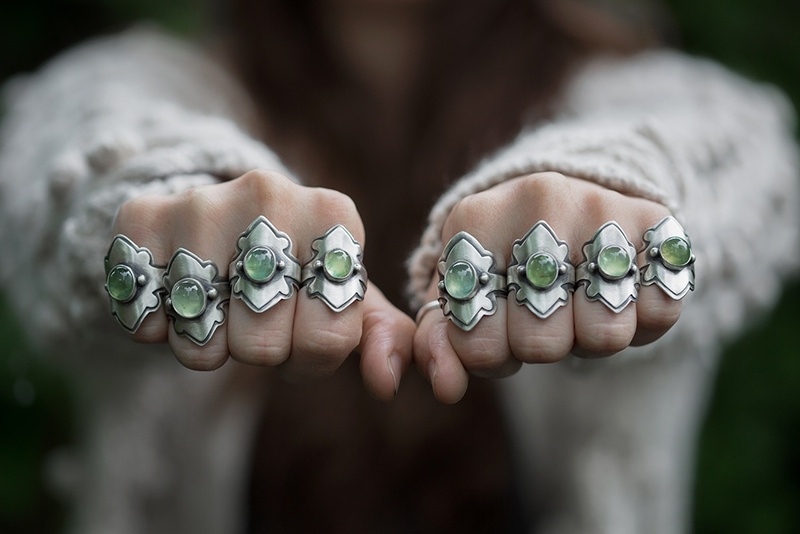 For these pieces, I chose the most luminous prehnite I could find. 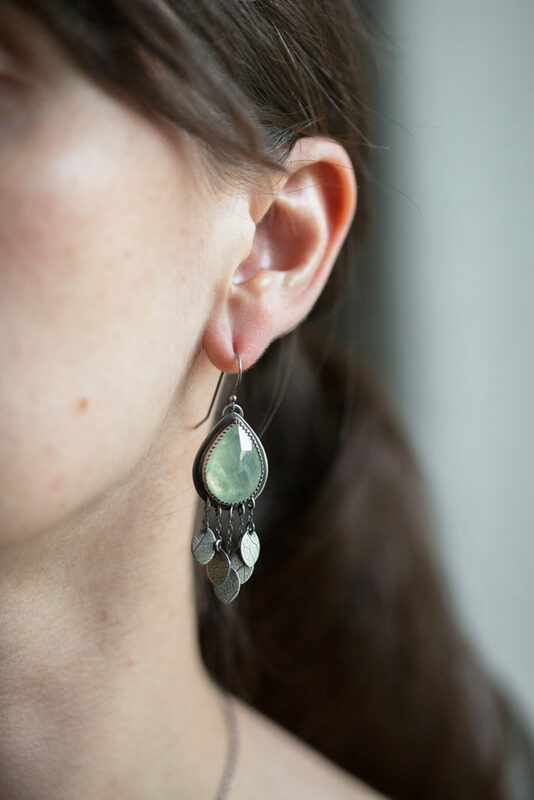 I actually contacted my lapidarist and had her custom cut the gemstones for these earrings. 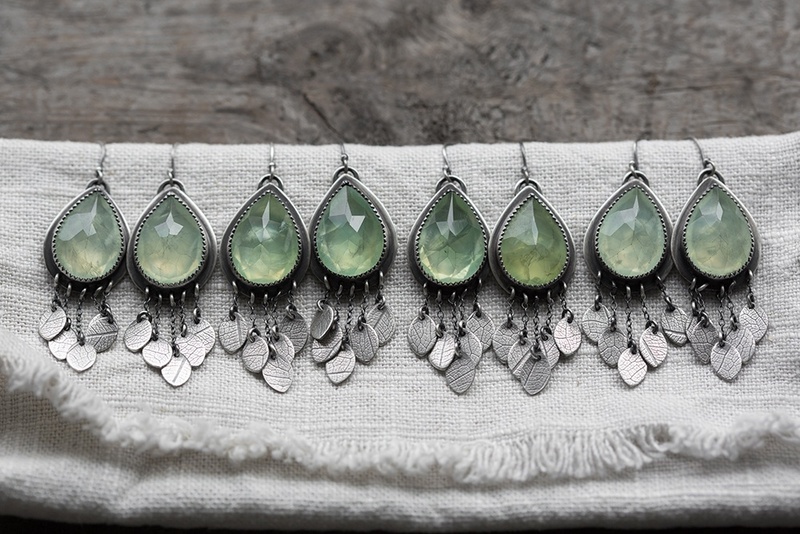 I wanted to use very high domed, faceted prehnite to best catch and reflect light, to make the earrings look as though they glowed with their own warm light, like the “young green” light of Laurelin. And below the stones sway tiny leaves. 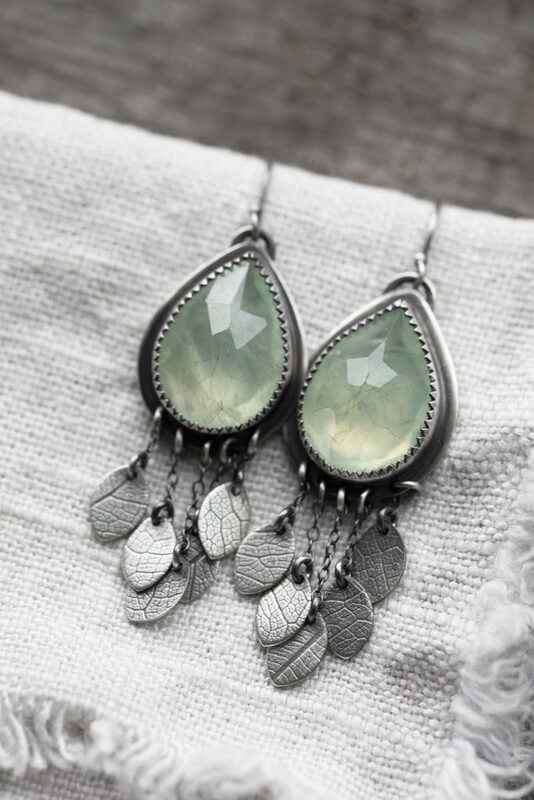 I chose to put the leaves on varying lengths of tiny chain to taper them to look as though the leaves were spilling towards the ground. 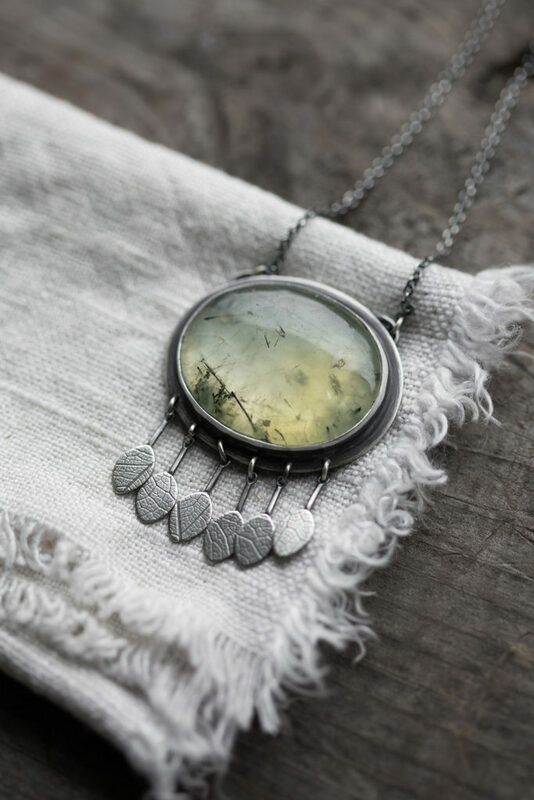 And for the necklaces, I sawed out several tiny leaves with a dark leaf print to dangle below smooth green prehnite. 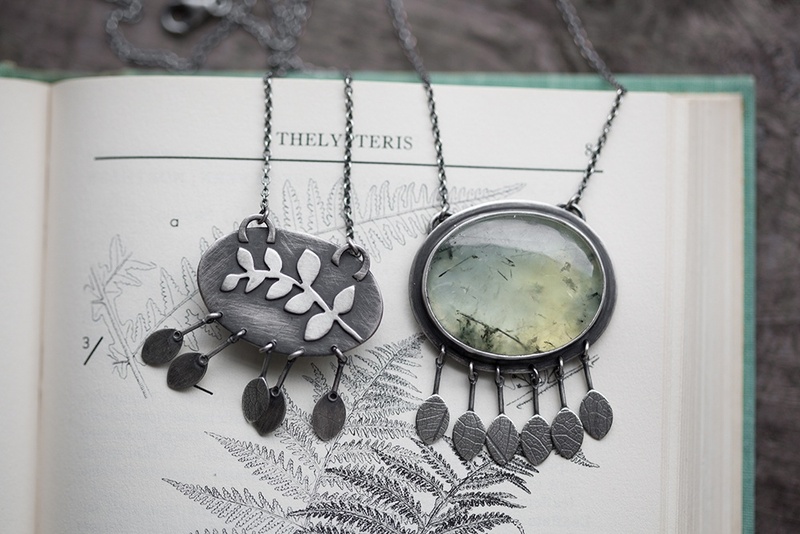 I wanted to this necklace to have the movement of fluttering leaves and the shade of Telperion. These leaves are on tiny, even bits of wire to give the sway more structure and shorter movements, like the short, sturdy movements of a strong, old oak. I wanted to distinguish them from the joyous lilt of the leaves that hang from Laurelin. 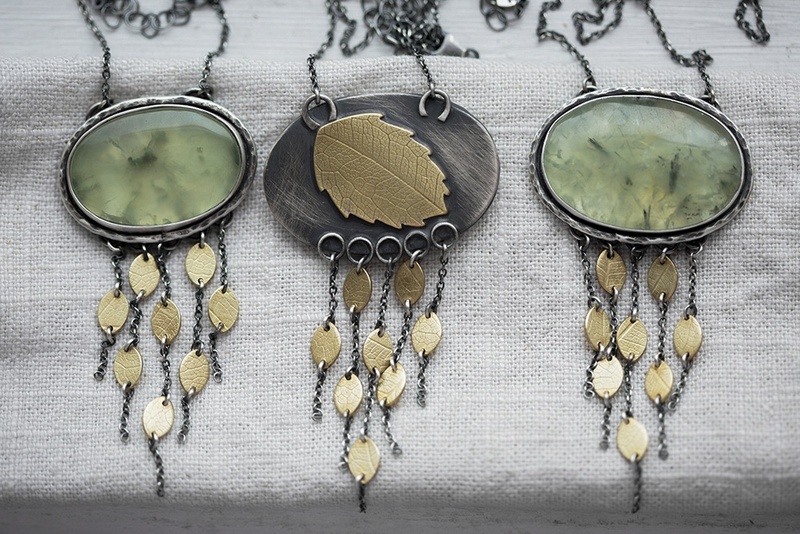 For my three Laurelin necklaces, I suspended brass leaves in a tapered fringe to represent the leaves which “spilled a golden rain upon the ground.” And on the backs, I have fixed warm, brass beech leaves. And so here they are, the pieces most distinctly drawn from The Silmarillion. 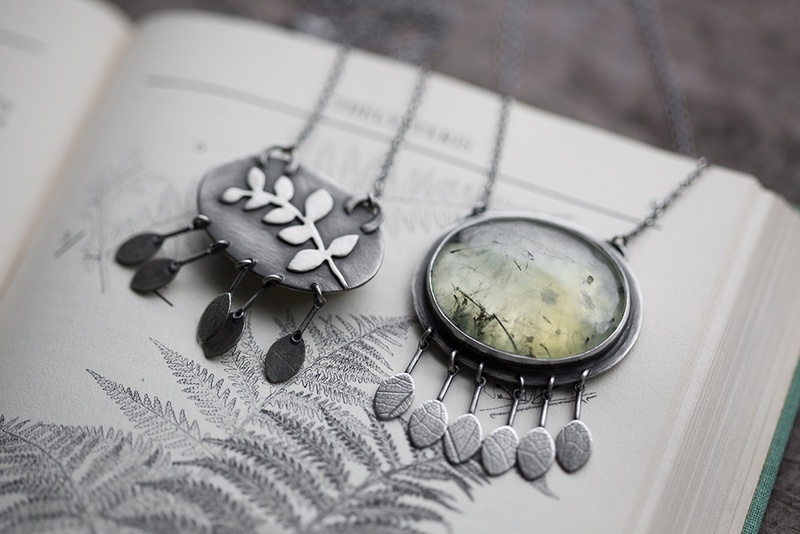 I can hear whispers of the book in my other pieces, but these are the designs that were approached with the deliberate intention to transmute Tolkien’s creations into metal. This book has so captured me heart and soul for the past several weeks, I knew I needed to preserve this experience in art somehow. 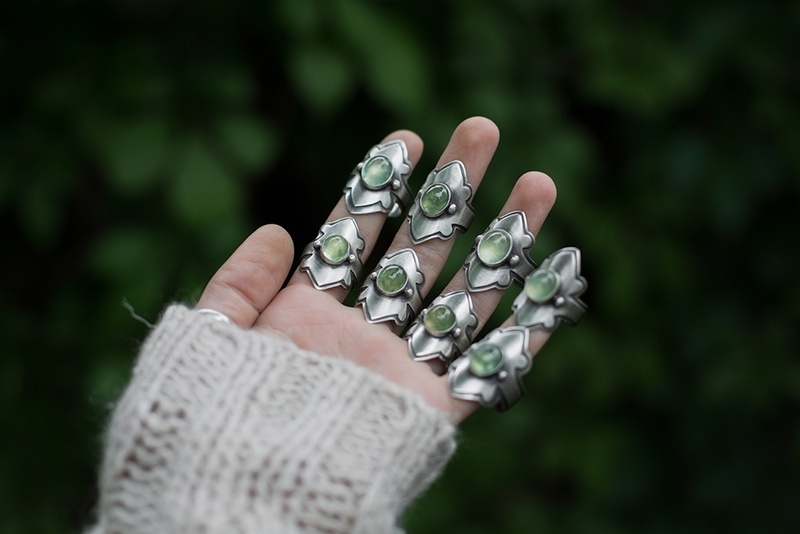 And so, these pieces are for Yavanna, Tolkien’s lady of the forest, and her creations. 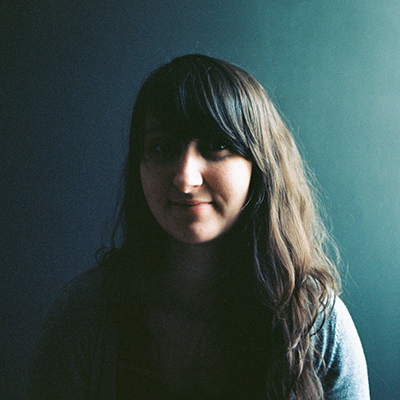 I hope to see you at the shop update! All these pieces in this Mossflower preview, as well as in all the others, will be available on Sunday, June 3rd at 7:00 p.m. EST in the Etsy shop.